Past APA leading lights caused their patients great suffering and anguish with their 'desperate cures.' Some things never change. 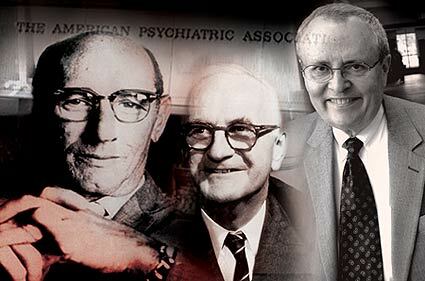 A LEGACY OF ABUSE: Past APA Presidents Jules Masserman (left) and Ewen Cameron (center), and today's APA head Steven Sharfstein (right) exemplify the brutal nature of psychiatry, victimizing the most vulnerable at great profit. Masserman surrendered his medical license in disgrace after patients accused him of sexual abuse. Cameron destroyed people's minds with combinations of drugs, including LSD, and electric shocks. Sharfstein's coercive arsenal also includes electric shocks; human rights violations at facilities he controls are under investigation by Freedom. The American Psychiatric Association changes presidents every year; with characters like these comprising the APA's "elite," it's not hard to see why. Steven Sharfstein, president of the American Psychiatric Association, puffed with pride on the subject of his appearance on "The Today Show," calling it his "15 minutes of fame." Unfortunately for him, that exposure produced far more than 15 minutes of acute embarrassment for psychiatry, as questions raised during the show forced him to admit that no test exists for a "chemical imbalance" as the cause of mental disorders. Indeed, in less than 15 seconds, he repudiated the mainstay of modern psychiatric "treatment" with his statement, "We do not have a clean-cut lab test" for such disorders. The heavily promoted but thoroughly discredited "chemical imbalance" theory underlies psychiatry's high-volume administration of drugs to children and adults — even those given against their will. As Freedom has learned, Sharfstein has no qualms about administering drugs, electro-convulsive shock "therapy" and other treatments that people do not want (or need), calling such "compassionate coercion." Jules Masserman, APA president from 1979 to 1980, sexually abused female patients drugged with sodium amytal he administered under the pretext of helping them to delve into their "subconscious," billing in the thousands for his "services." In her book, You Must Be Dreaming, singer and actress Barbara Noel described being drugged unconscious by Masserman and awakening to find him, naked, on top of her. After she sued, Masserman settled with her in October 1986 for $200,000, with $50,000 more paid to three other female patients who came forward. Yet, in November 1986, at the 11th World Congress for Social Psychiatry in Rio de Janeiro, the organization's president praised Masserman as "the most prominent psychiatrist in the world." In 1987, evidently fearing a probe by an Illinois agency of his misconduct, Masserman surrendered his medical license. Today, a Sharfstein contemporary, APA distinguished fellow Harold Koplewicz, promotes himself as "being recognized as one of the nation's premier child and adolescent psychiatrists." Koplewicz, of Bellevue Hospital and New York Uni-versity's School of Medicine, has appeared on national TV, expounding upon what he viewed as the necessity for intervention by Child Protective Services (CPS) if a family declines to drug a child after a psychiatric diagnosis. In the context of abuses as described in this edition of Freedom, advocacy of coercive acts against children and families is chilling, and one more example of the APA's arrogance and perverse view of individual rights. One parent with experience in this regard is Patty Weathers. Appearing at the October 2004 Food and Drug Administration (FDA) hearing that directly preceded issuance of an agency order regarding black-box warning labels — the FDA's most severe cautionary note — Weathers testified that her son hallucinated, heard voices, and became violent and psychotic while on an "antidepressant." Now the head of AbleChild: Parents for Label and Drug Free Education, a nationally recognized nonprofit organization dedicated to the support of children's and parents' rights, Weathers told Freedom that Koplewicz's endorsement of that same drug as "safe and effective" was "beyond irresponsible." "I would tell all parents never to contact him," she said. If you have kids, she added, don't walk away from him, "Run as fast as you can!" Unfortunately, all too many of psychiatry's victims — young and old alike — never had that chance.